4 Nov 2017 – In Paula Bronstein’s photographs of the Rohingya exodus from Myanmar, there are no shoes. Men, women and children trudge wearily along the embankments of rice paddies, wade muddy rivers, or pick their way across flimsy bridges of lashed-together bamboo poles, all in their bare feet and carrying almost nothing but the occasional bundle of clothes, and their infants. Bronstein, who has covered wars and refugees from Afghanistan to Sudan to Lesbos, Greece, has been photographing the Rohingya, an essentially stateless Muslim minority among the Buddhist majority in Myanmar, off and on for years. She was drawn back there after a clash with the Myanmar police in August touched off a swift and brutal campaign of ethnic cleansing that in less than two months has driven more than a half-million people from their homes and villages to refugee camps in neighboring Bangladesh. Bronstein spent a month on the assignment, roughly from the middle of September to mid-October, toward the end of the monsoon season. It was, she says, one of the most physically challenging environments she has ever worked in — rainy and muddy and hot and humid, even for Southeast Asia. From the border, she saw smoke rising from villages torched on the Myanmar side. One refugee, heavily bandaged from her wounds, told Bronstein that the attackers had locked her family in their house before setting it afire; she and her 8-year-old daughter had crawled to safety, but six other members of her family, including four children, perished in the fire. Bronstein photographed the funerals of five children and witnessed the capsizing of two small watercraft crossing the Naf River. 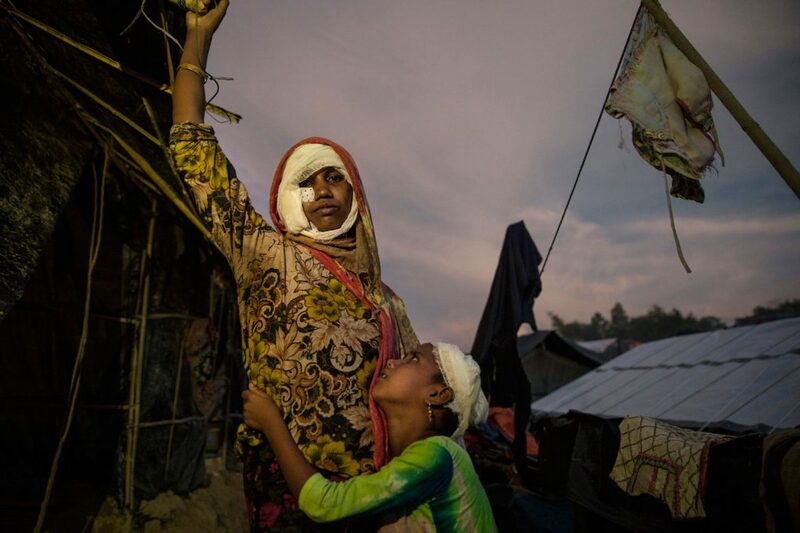 Mumtaz Begum, 30, with bandages covering her wounds, is held by her daughter Rosia, 8, on Oct. 15, standing outside their makeshift tent in Balukhali camp, Cox’s Bazar. Mumtaz arrived over a month ago from Myanmar. She had suffered injuries after being attacked with a machete and burned when Burmese military men torched their house with everyone inside. She says that they locked the door, so she had to crawl out to escape to survive. She lost six members of her family, including three sons and one daughter. For the fleeing refugees, the trek to the border from their villages typically takes anywhere from three to 10 days. 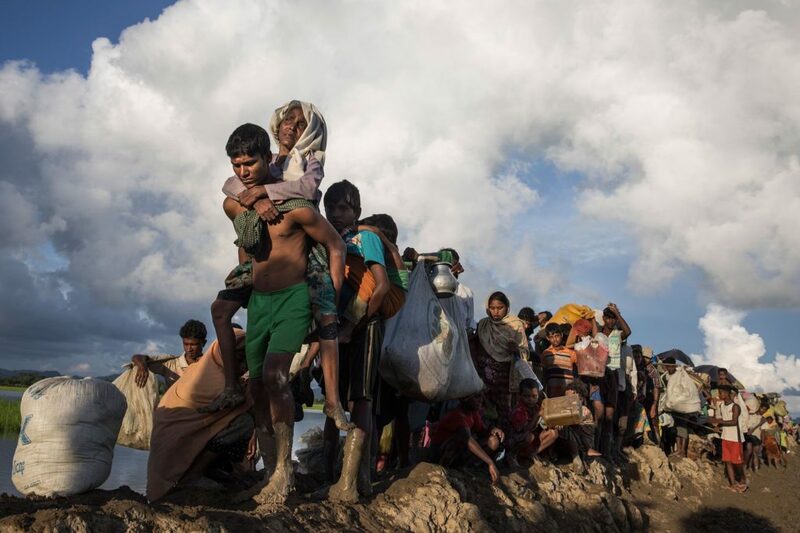 The end of their journey is immense sprawling camps in the Cox’s Bazar district of Bangladesh, where they are fed and cared for by refugee agencies — but they have no clear idea of where they will end up. Bangladesh authorities have warned of an “environmental catastrophe” in the region, as the desperate refugees have denuded hillsides for wood to build shelters and burn for cooking. The area is also the site of wildlife refuges, and at least six Rohingyan refugees, having survived the slaughter and trek from Myanmar, have been killed by wild elephants in the camps.